One of the things about your birthday is that it only happens once. You will be six years old one time only. Likewise, you will only be sixty once. I was six years old once a long time ago, now I’m sixty. Once. Someday, I may be sixty-four. 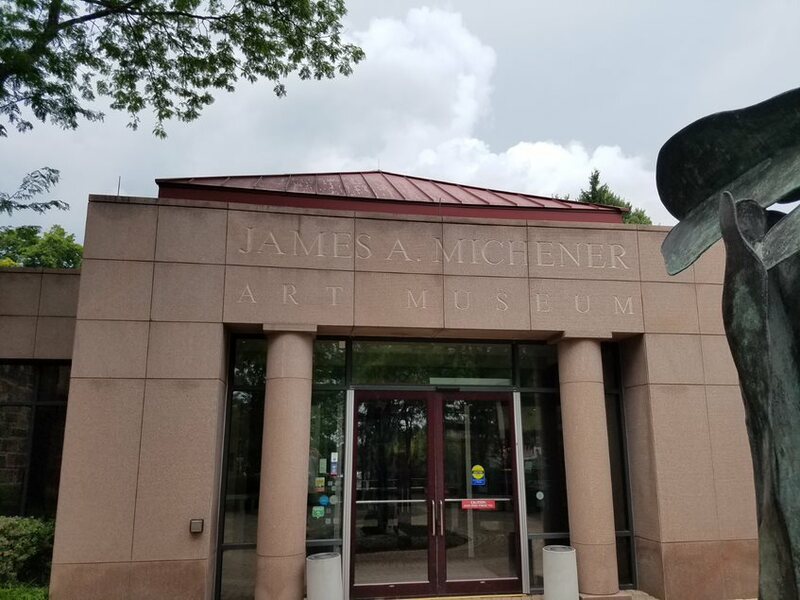 I celebrated by visiting the James Michener Art Museum in nearby Doylestown, PA. People may have a hard time remembering who James Michener was, but, years ago, his books lit up the bestseller lists. He was one of the great American writers of the 20th century. Michener passed away in 1997 at a ripe old age of ninety. I put him in the same category as Herman Wouk, who’s still writing, as I type these worlds, at the age of 103 (I want to be that guy). 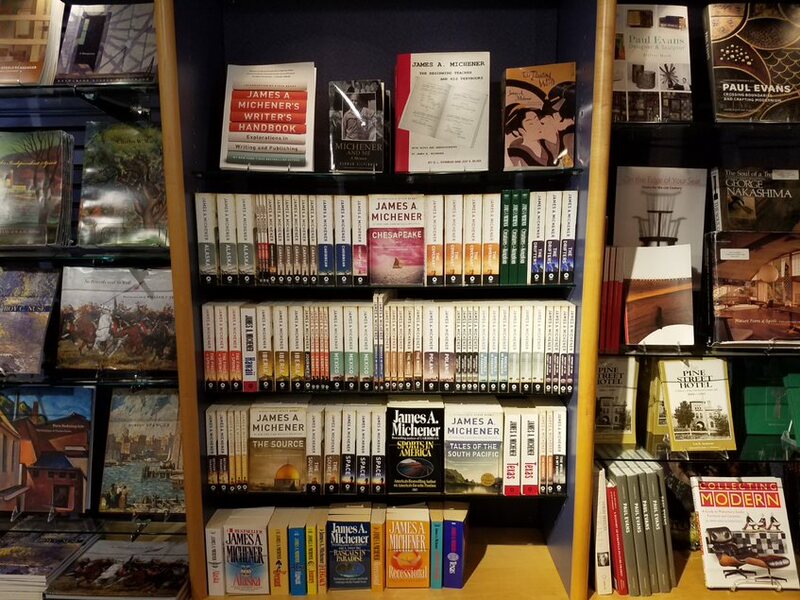 Other big-name writers of the last millennia have faded to obscurity, although people still remember Harold Robbins and Norman Mailer. Michener knocked it out of the park with his Tales of the South Pacific (1947), a book about his experiences in WWII. This is the book that created Tiki culture in the USA. South Pacific was adapted for the stage by one of Michener’s neighbors, a guy named Oscar Hammerstein and the rest was history. Admit it, you’ve all heard “Some Enchanted Evening” and clouded up. Most of what’s in the Michener Art Museum are paintings, of course. Michener was cranking in the $$$ with his doorstopper novels years before people tossed cash at books about killer canines and manipulative billionaires. He used his cash to fund the museum. For which the good citizens of Bucks County Pennsylvania are grateful. Many of his books were adapted as big budget movies. I remember when the movie version of Hawaii (book 1959, movie 1966) played at Dayton, Ohio’s new Salem Mall Cinema when I was a kid. The mall, by the way, was torn down over ten years ago. After I’d paid my modest admission fee, I looked at the paintings and art photographs. Quite a few are from the local area. Doylestown is close to New Hope, the Eastern Pennsylvanian version of Greenwich Village. There are many from all over the world and even a room that shows them projected on the wall. 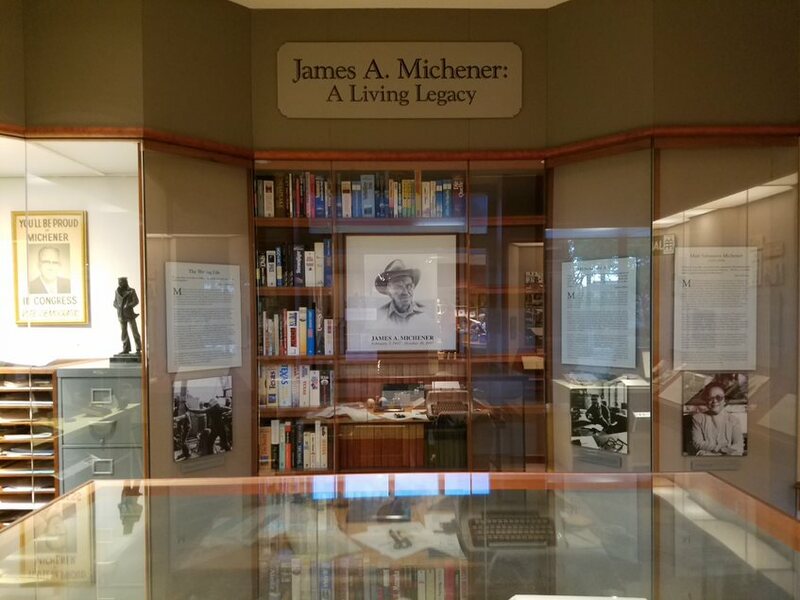 What i wanted to see most was the typewriter that Michener used to create his masterpieces. Not only does the museum have his typewriter, it has his entire office set-up in a side room. You can walk into it and see how the great author worked. Everything, including his shelves, is behind plexiglass. However, it’s still possible to get close to what he used. There is a sense of eeriness as you looked down at the electric typewriter on his desk and see the manuscript in it, complete with corrections. Hard to imagine anyone looking at my NEO2 word processor with the same misty eyes. Michener had a great audio system as well. One side of the room shows his reel to reel tape selection. I like to imagine him banging away at the keys while listening to New Orleans jazz. One plaque mentioned he worked to get out 2000 words a day. Which made me feel a whole lot better as I struggle to crank 5000 words daily when I’m at work on a book. However, Michener didn’t have a word processor. One final mention must be made of The Archive in Lansdale, PA, still a great place to kill an afternoon. It’s stacked full of old books and paper memorabilia. I picked up my copy of Youngblood Hawke by Herman Wouk for a few dollars. It’s a 70’s reprint in paperback, but still a hefty read at 878 pages. This makes the second typewriter of a major writer I’ve seen. 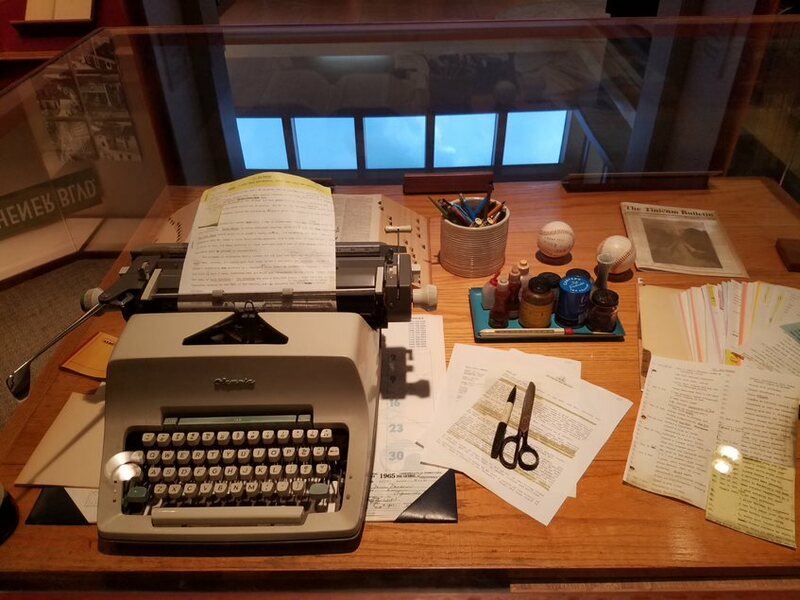 A few years ago, I was able to view Ian Fleming’s typewriter. On to the next one! The sacred Michener typewriter. Standing close can increase your Amazon ranking. Hey! Great job! I didn’t know you had a website! Keep your little sister updated! !